Abstract: Uncertainty over Guibert’s reasons for writing his autobiography, the De vita sua, has prompted attempts at psycho-historical analyses of his personality. Such studies, in particular those of Benton and Kantor, have tended to rely overheavily on over-simplified psycho-analytical models and ignore cultural, historical and religious factors. An appreciation of such factors, however, does much to improve our understanding both of Guibert’s personality and his reasons for writing. On the other hand, psycho-history is not to be dismissed as a worthless aid to the writing of history. With the application of suitable safeguards, as the work of Dom Jean Leclerq has demonstrated, it can form a most useful addition to the historian’s armory. Introduction: Guibert, abbot of the Benedictine monastery of Nogent-sous-Coucy in the diocese of La on, France, was born around 1053 near Clerrnont-en-Beauvaisis of lesser noble stock. At birth, difficulties in his mother’s labour and fears for the child led to his being dedicated to the religious life. Eight months later, Guibert’s father died and his mother, scorning remarriage, was left to raise her children alone. Between the ages of six and twelve, Guibert was trained as a clerk by a tutor, whom his mother appointed. When Guibert was twelve, his mother retired to live the life of an anchoress outside the monastery of Saint Germer de Fly, and his tutor followed her example by becoming a monk. Left alone, Guibert spent some months in close contact with his lay cousins before deciding to become a monk himself, entering the monastery of Fly. There he remained for forty years, concentrating, after a flirtation with the Latin classics, on works of biblical exegesis, a task for which he had initially received encouragement from St Anselm of Bee. 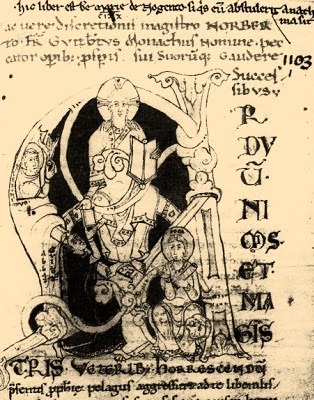 Around 1104, he was elected abbot of Nogent, where he remained until his death in about 1125.